Reading your list of shoes, my electric-blue plush slippers seem positive paragons of restraint. Goldfish, I recently had to go through a closet full of barely worn shoes & clothing and it was very depressing. The fact that these stylish items hadn't been worn by me for so long that they had literally become moldy brought tears to the eyes. I'm not really sure which is worse; keeping them but never being able to wear them or getting rid of them and then wondering if I made a mistake. I can't throw shoes away. I now have 16 pairs of trainers/sneakers alone. Bought another pair of dead snazzy laceless Converse only last week. Charles - what you say is very true when it is a worthless thing like a cardboard box. Throw away a cardboard box and the next day you will need to post some oddly shaped item for which that box would have been a perfect fit. I have to say though that I can't remember too many other things this has happened with. Mumpy - your wardrobe disaster sounds terrible, but your DMs sound almost as funky as Charles' slippers. 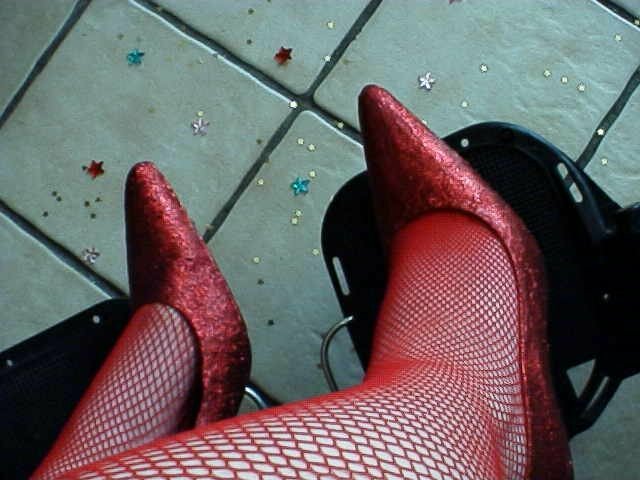 I used to have black DMs which were spray-painted gold, so they looked kind of tarnished (I actually nicked them from an abandoned piece of art work at school - long story). Marmite - I'm sure you too could get a pair of knee-high high-heeled purple snakeskin boots in your size, but would you actually be able to walk in them? 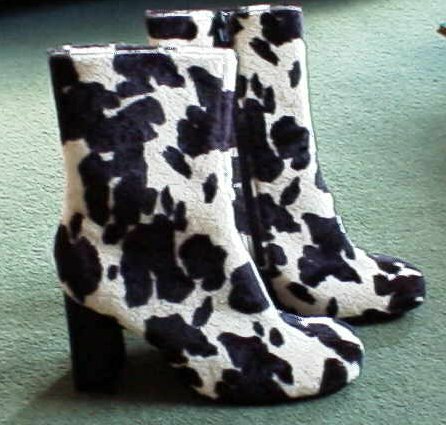 Having seen GF in her pair of high-heeled knee-high snake-skin boots, I can say they are fab.